Dan Allan shared thoughts about staying fresh in ministry during Tuesday morning’s session. Dan Allan went beyond the usual list of suggestions for how to stay fresh in ministry on Tuesday when he shared his thoughts with the Central Focus Retreat. He shared three points: lighten the load, look to Jesus, and lower your expectations. “Be constantly lightening the load,” he said, as he talked about pride and unbelief. He said to not believe the lies that Satan tells, such as if you perform well, God will find pleasure. “Are you seeing new implications of the gospel in your life?” He noted that God is good, not because he gives us all, but because He is good. “There is a strong sense of calling when we are constantly looking to Jesus,” he added. “The power of the gospel can change anything, but the power of the gospel doesn’t change everything until later,” he stressed. 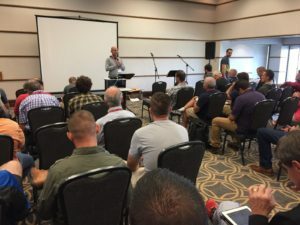 The morning session was the beginning of a day when Grace Brethren pastors and leaders considered the topic of mentoring in the local church. They spent some time unpacking the thoughts that Dan had shared, then broke for lunch and an afternoon of free time. Options included golfing, bicycling, hiking, resting, or enjoying an afternoon of conversation, then dinner on their own. Following dinner, a panel of five church planters from the region shared about their ministries and who were important mentors in their lives. Then each had the opportunity to ask questions of the audience. The evening concluded with fellowship around a bonfire and an evening snack of smores and hot chocolate. The retreat is being held at the Maumee Bay Resort and Conference Center in Oregon, Ohio, where fifty-five Grace Brethren leaders from around the midwest have gathered. It continues through Wednesday morning. See additional photos at https: facebook.com/graceconnectus.